James Reviews – The Oxford Paperback Italian Dictionary, 1997 edition – James Proclaims! If you are a student of the Italian Language in the late nineties then this dictionary is a ‘must have’. If you’re an Italian speaker who is trying to improve your knowledge of the English language circa 1998, then it may also prove useful. The cover boldly claims that it’s ‘The biggest paperback dictionary of its kind’. It doesn’t clarify what it means by ‘its kind’ so it’s difficult to confirm if this statement is accurate, or even if it was accurate in 1997. The cover also claims to be a ‘new edition’. That is evidently not the case – it was already two years old when I bought it, so the notion was a little fanciful even then. Nonetheless, it is still the latest edition of the Oxford Paperback Italian Dictionary. The modern ‘equivalent’ is known as the Oxford Essential Italian Dictionary. Why the change from ‘Paperback’ to ‘Essential’? You’ll have to ask Oxford. Anyway, if you need to translate between Italian and English at a reasonably superficial level, and you haven’t got access to the internet, then this dictionary will help. I imagine the ‘Essential’ dictionary is more up to date and includes translations for more modern words like ‘yolo’ and ‘xoxo’ like what the kids are saying now. But if like me, you don’t use expressions like that ever, then really the 1997 edition is probably better. Remember the late 90s? Back when we were all watching Buffy the Vampire Slayer and Dawson’s Creek? Those were the days. This dictionary is the ‘Roswell High’ of Anglo-Italian lexicons. 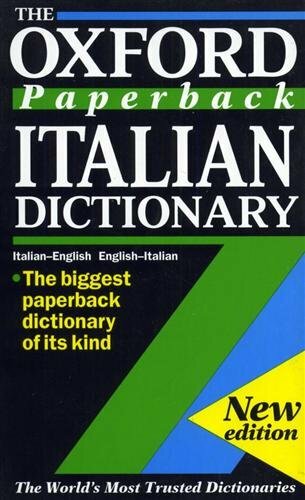 Admittedly, if like me, you haven’t actually studied Italian since getting a satisfactory grade in the course you were accessing prior to the turn of the millennium, then you probably have no use at all for this dictionary. You might even wonder why it’s taking up valuable space on your bookcase. It seems quite a stretch to suggest you still have it for sentimental reasons. Frankly if you’re anything like me then were you to study Italian again, you’d use the other, much bigger dictionary that you also purchased in the late nineties. Or you’d use a website like wordreference.com, because that’s much more convenient. But if this review has piqued your interest and you do want the above dictionary, you can get it for a steal on Amazon. Or you can have my copy for free. You will need to pay for postage but I’ll throw in a ‘Teach Yourself Italian’ cassette tape to sweeten the deal. Anyway, come back next week for more reviews of products that you didn’t realise that you needed. Bahaha. When I was a senior in high school I went to Italy and Greece over spring break (oh the wonders of having a part-time job and a savings account. I bought a similar title which I ended up not using at all. Swear words, pizza, and tiramisu are all pretty universal words, it seems. Funny — I just read this, a few days after I wrote about learning a second language. Can you get me a copy in German? Cassette tape. I considered taking you up on this. Not because I want to learn Italian (I live in Midwest USA, we should have a dictionary of our own…). Alas, I don’t meet many Italians, but I saw a few on the televised TdF. Not that the dictionary would have helped. No, it wouldn’t have helped, but it would look great on your bookshelf!